← Does the Form of Vitamin You Take Matter? 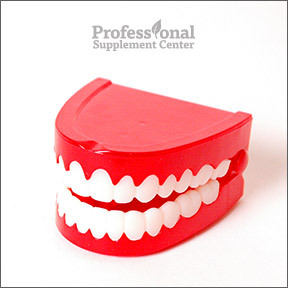 We all want to have a bright smile, fresh breath and healthy teeth. Sometimes though, it’s easy to “brush off” daily flossing, biannual dental checkups or even cleaning our teeth before we settle down for the night. When we do this too often, we jeopardize our dental health and increase the risk of acquiring dental decay and gum disease, which can affect not only our dental health, but our overall health as well. Oral health, whether good or bad, mirrors the condition of the health of the body and can have a huge impact on our quality of life. Chronic oral inflammation, resulting from the low grade infection caused by moderate or advanced periodontal disease, is associated with the development of cardiovascular disease and stroke. Besides being tender and unsightly, chronic swollen and bleeding gums, known as gingivitis, can lead to bone and tooth loss. Studies have shown that oral bacteria resulting from substandard dental hygiene is associated with poor neurological health, memory problems and declining cognitive skills, providing very good motivation to address dental health issues. Tooth abscesses have been linked to infections in other parts of the body, a good reason not to ignore a cavity. Statistics show that hospitalizations resulting from untreated dental abscesses are on the rise. Research has shown similarities between unhealthy gums and joint inflammation, including the destruction of connective tissues, such as seen in rheumatoid arthritis. People with diabetes are at higher risk of gum disease and other infections. Protecting oral health may aid blood sugar control, so be especially diligent with oral care if you have diabetes or risk factors for developing diabetes. Poor oral health during pregnancy is linked to preterm, low-birthrate babies, so it’s very important to properly care for and maintain healthy teeth and gums while pregnant. Significantly, just as an eye exam may determine health problems in other parts of the body, such as high cholesterol levels, diabetes and high blood pressure, an oral exam can reveal conditions such as osteoporosis, digestive and eating disorders, kidney disease and cancer. As we all want and need our teeth to remain healthy and last for a lifetime, taking good care of your oral health is well worth the few minutes it takes to floss and brush regularly. And those twice yearly visits to your dentist for an exam and cleaning are very important, not just for a beautiful smile, but for the health of your body as well. Research suggests that disciplined people who exercise regularly, make healthy food choices and maintain their weight are more likely to floss daily and take good care of their teeth and gums. Those who make a commitment to their long term health know that one of the secrets to a long and healthy life may just be as simple as living mindfully. Propolis MGO 400+ & Manuka Honey Toothpaste with Manuka Oil by Manuka Health – Known for its healing and antibacterial properties, this mild menthol toothpaste contains premium BIO30™ New Zealand Propolis, high grade MGO™ Manuka Honey and pure Manuka Oil with natural plant extracts to gently cleanse. Studies suggest that Manuka honey may be able to reduce oral pathogens within dental plaque. Fluoride, sodium lauryl sulphate and preservative free formula. IPSAB Herbal Gum Treatment by Heritage – Naturally flavored with peppermint spirits, this astringent formula is recommended for healthy gum tissue and effective oral hygiene. Massage into gum tissues to strengthen and help shrink swollen gum tissues. Neem & Pomegranate Toothpaste by Himalaya Herbal Healthcare – This fluoride and saccharin free toothpaste contains traditional Ayurvedic herbal ingredients such as neem, triphala, thyme, botanicals, essential oils and pomegranate to aid in promoting clean and healthy teeth and gum tissues. Neem has been used for thousands of years for its anti-inflammatory and antibacterial properties. This entry was posted in Home and tagged Gum Disease (Gingivitis), How Oral Health Affects Overall Health, IPSAB Herbal Gum Treatment by Heritage, Neem & Pomegranate Toothpaste by Himalaya Herbal Healthcare, Oral Infections Causing More Hospitalizations, Oral Warning Signs Can Indicate Serious Medical Conditions, Professional Supplement Center, Propolis MGO 400+ & Manuka Honey Toothpaste with Manuka Oil by Manuka Health, Researchers find potential link between gum disease and Alzheimer's, Vitamins and supplements, www.professionalsupplementcenter.com. Bookmark the permalink.